'Tis the Season for Giving! I have to say, I LOVE this time of year and giving to my students. For one, it gives me an opportunity to channel my inner Oprah as I shower each of my students with a gift and it also gets my creative juices flowing as I figure out how to do so on a small budget. Bargain shopping and finding a good deal is my equivalent of hunting. I am so pumped to not only get a great deal but to then share it with others?? I get giddy just thinking about it! Here are a few of my gift giving ideas and a breakdown of what they would cost. Water bottles are always a hit with my students, especially when they are personalized with their name. This year, I purchased the water bottles at naeir.org. Naeir is a program that helps you stretch your out of pocket expenses for your students by offering a significant discount on materials. If you work in a school, you can apply for a free teacher membership here. The products they offer and prices vary depending upon their supply. I purchased 40 of these water bottles for $12.00 (that's only $0.30 each). I then used my Cricut machine to cut out my 2nd-6th grade students names, which added another $3 to the product. The final cost was just under $0.38 per student. Another option is to use tumbler cups from the Dollar Tree, as displayed above, and insert a nice note for your students. Did you know that you can order large quantities through their website and have them shipped (for free) to the store? You do typically need to order in multiples of the quantity that is contained in a case. That particular year, I ordered 3 cases of 24 tumblers each. These chalkboards were perfect for my Kindergarten and first grade students. They are 12"x12" in size. I purchased them through Naeir as well at a cost of $8 per 21 pack. I purchased 2 packages which will leave me with a handful to spare. The final cost with vinyl and a piece of chalk was $0.50 per student. Snowman soup is another idea I have used in the past. I simply placed a packet of hot cocoa that contained marshmallows within a folded piece of card stock that contained the poem above and attached a candy cane to the front. The box of hot cocoa was $1.29 per 12 pack and candy canes with $1.39 for a 12 pack, bringing the cost to $0.24 each, not counting the card stock and ribbon that I had on hand. The next idea is an ornament that contains curled pieces of paper with positive attributes written on them. You can currently purchase plastic ornaments at Michaels for $0.31 each. If you work in a school, don't forget to use your school ID to save an additional 15% off. This is a great activity to complete in therapy with your students. Print out positive attributes and cut them out into strips of paper. Have students select attributes that describe themselves or other members of the group to create ornaments that are an unique reflection of themselves. Simply, curl the strips around a pen or pencil to curl them and place them within the ornament. Tie a ribbon on the top and you have an ornament that will be cherished for years to come. Think of all the language that creating these ornaments can evoke as you discuss the vocabulary contained within them, formulate sentences, compare/contrast, follow directions, etc. It is loaded with opportunities! Reading Polar Express? Make jingle bell necklaces with your students that they can keep as a holiday gift from you. You can purchase jingle bells (different than shown) at the Dollar Tree in packages of 9, which brings the cost to $0.11 per student. A couple years ago, I hand stamped washer necklaces for my students. The girls received the washer version and the boys received dog tags. The one pictured above was a gift that my daughter made for a friend but will give you the general idea. You can purchase washers for approximately $0.10 each but will also have to add Organza Ribbon Necklaces ($7.99/50 pack) which brings the final cost to about $0.26 each. Now this gift certainly would not be for your students but would be a fun option for a colleague. I purchased the beverage caddy at Target for $7. I purchased Black Cherry soda at the grocery store (or you could add a different beverage- wink, wink) and attached fun labels created by the Peachie Speechie. I would love to hear what gift ideas you have in store for your students or colleagues! Comment below or email me to let me know what you have in mind! If you are a bargain shopper too or would just like to see what other ideas I use throughout the year, be sure to follow me on Instagram. 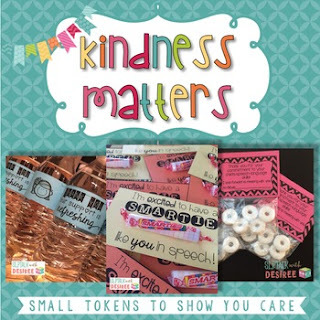 You may also enjoy this freebie of little tokens of kindness.